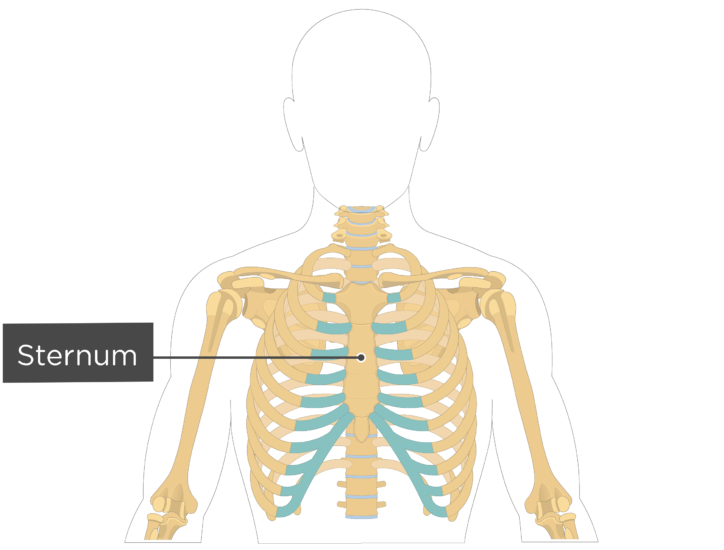 The sternum (pronounced ˈstər-nəm) is located in the center of the anterior thoracic wall and is also known as the breastbone. 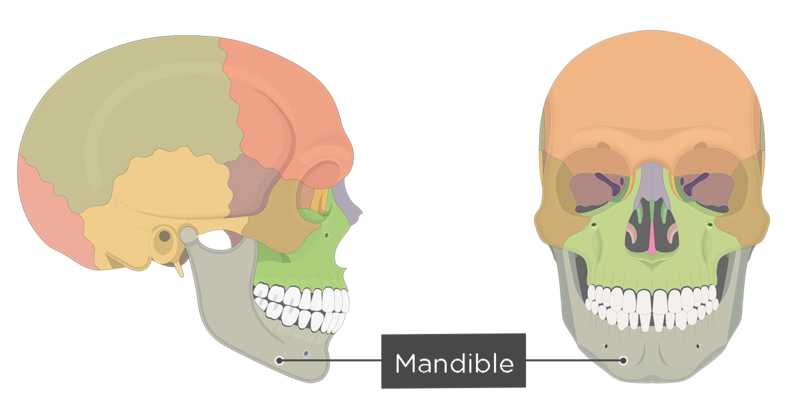 It consists of three segments, the manubrium, body, and xiphoid process. 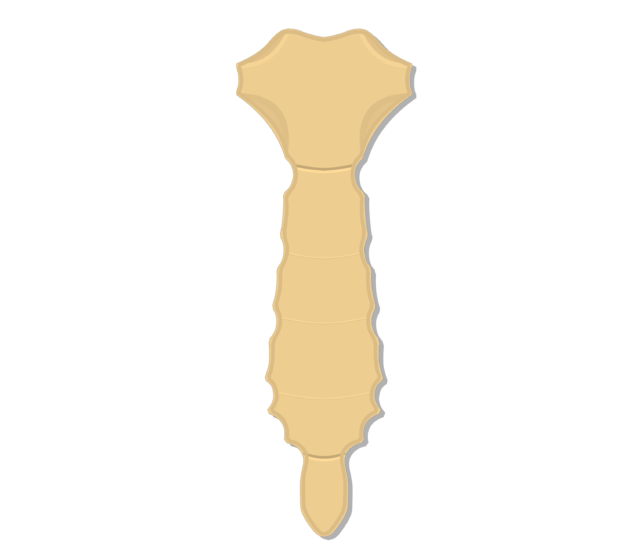 The segments fuse to form a long, flat bone. 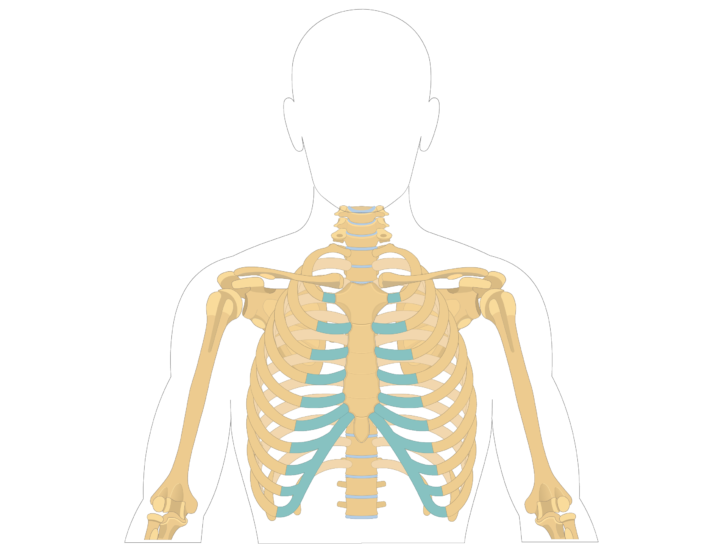 The sternum articulates with the clavicles and costal cartilages of the ribs. 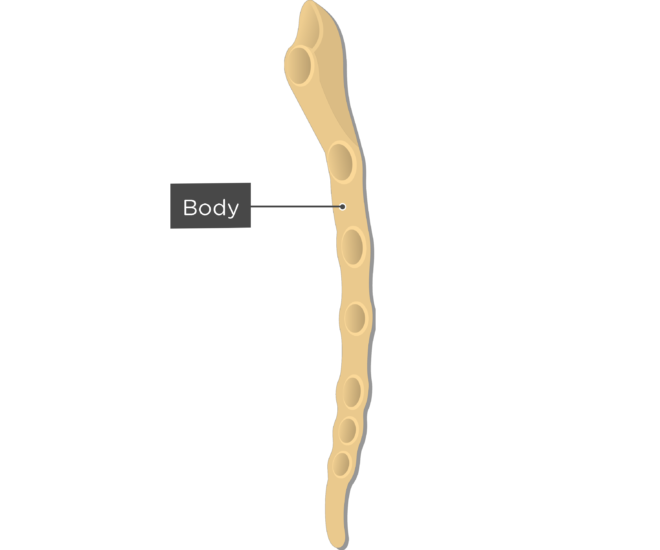 It also covers and protects the heart. 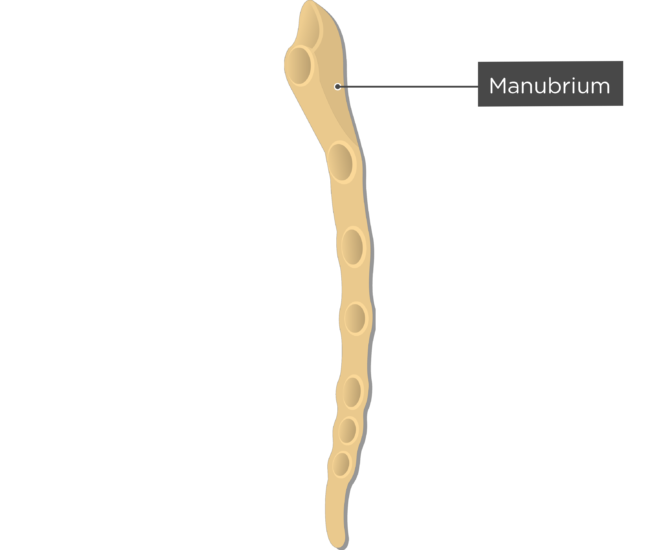 Manubrium (\mə-ˈn(y)ü-brē-əm\ L., handle) – triangular-shaped, superior portion of the sternum. 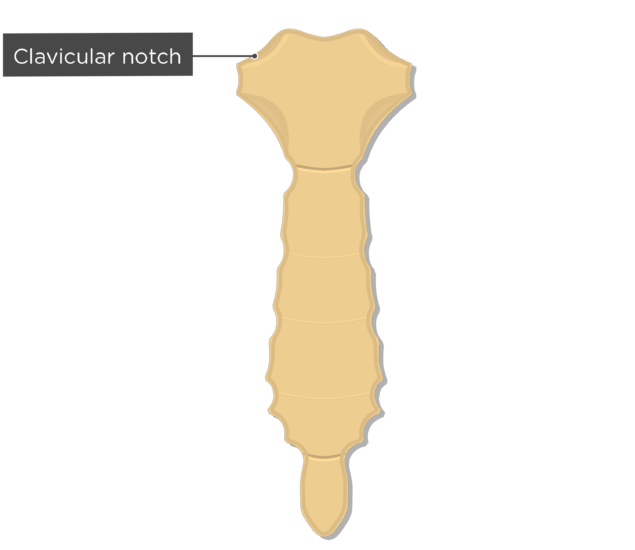 Clavicular notches – depressions on the superolateral borders of the manubrium. 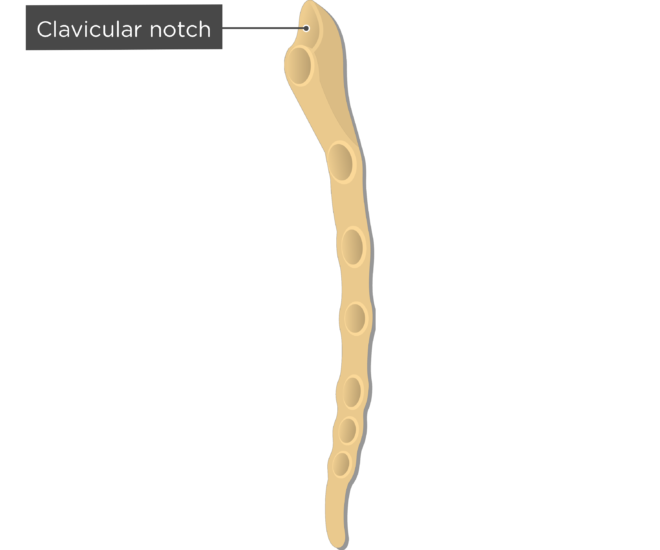 They serve as articulation points for the clavicles. 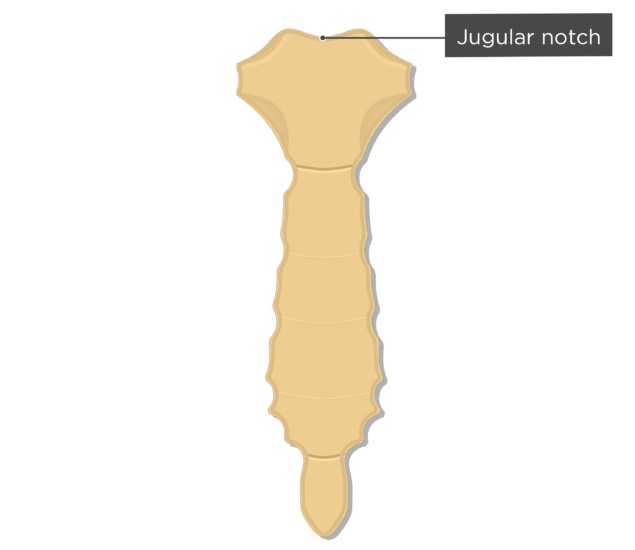 Jugular (suprasternal) notch – depression between the two clavicular notches. 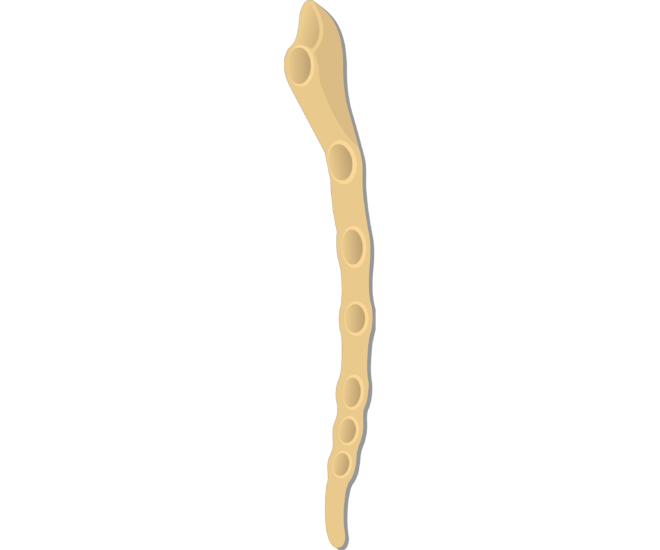 Body or gladiolu (L. gladiolus, little sword) – middle segment of the sternum. 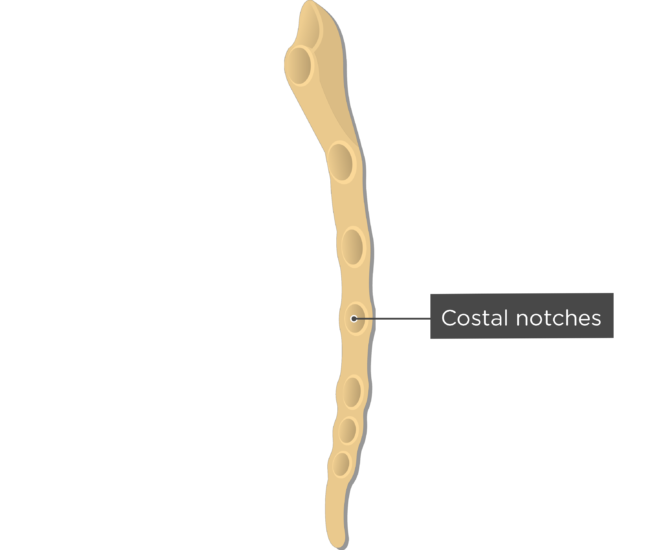 Costal notches – 7 small depressions located on each side of the sternum. 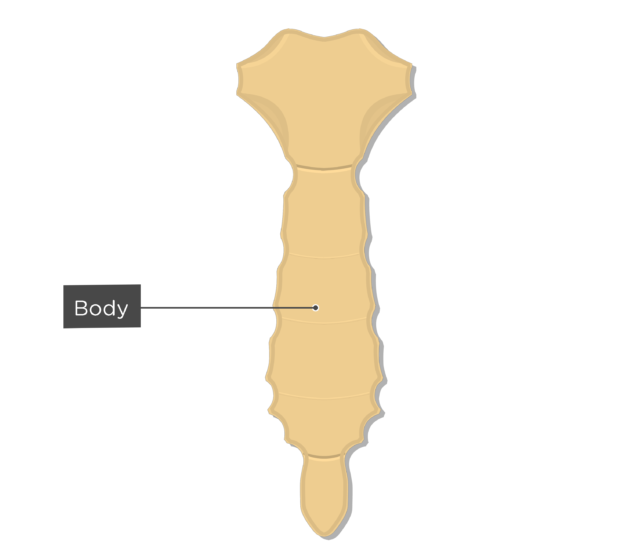 They serve as areas of attachment for the costal cartilages of the first 7 ribs. 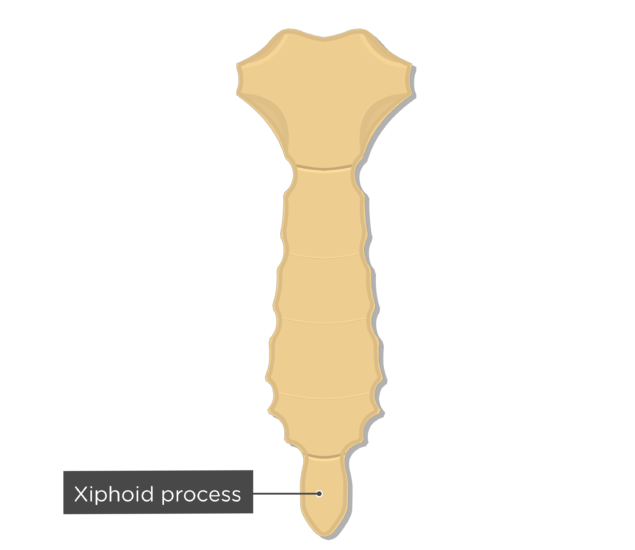 Xiphoid process (\ˈzī-ˌfoid\ Gr., xiphous sword + eidos, form) – inferior segment of the sternum. 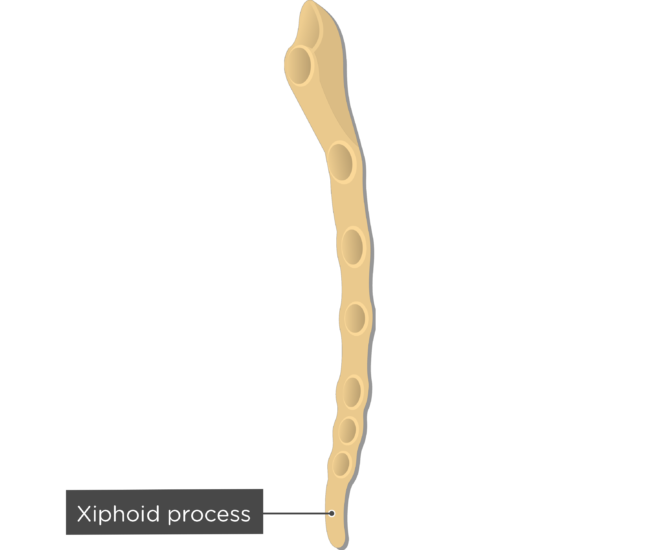 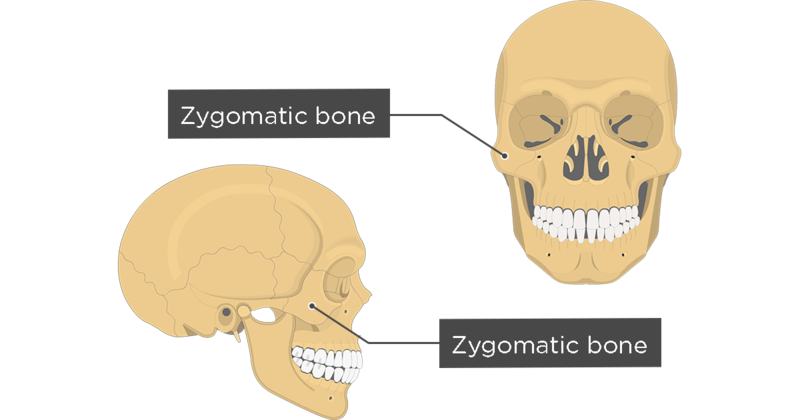 The xiphoid process is composed of cartilage early in life and typically converts to bone by age 30-40. It serves as an area of attachment for the rectus abdominis muscle. 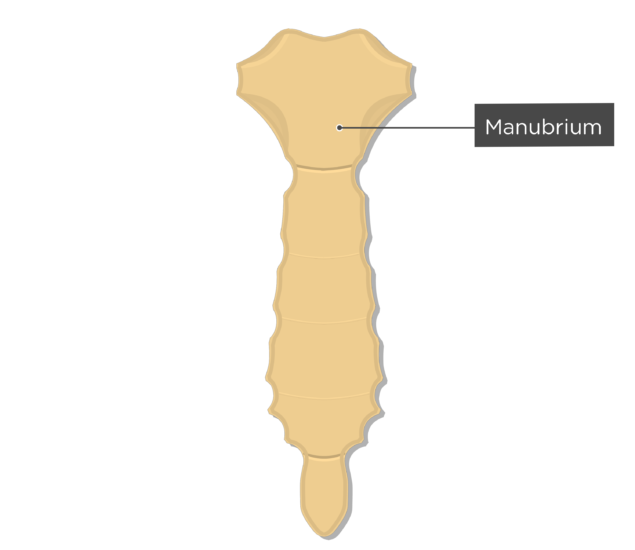 Manubrium – triangular-shaped, superior portion of the sternum. Clavicular notches – depressions on the superolateral borders of the manubrium. 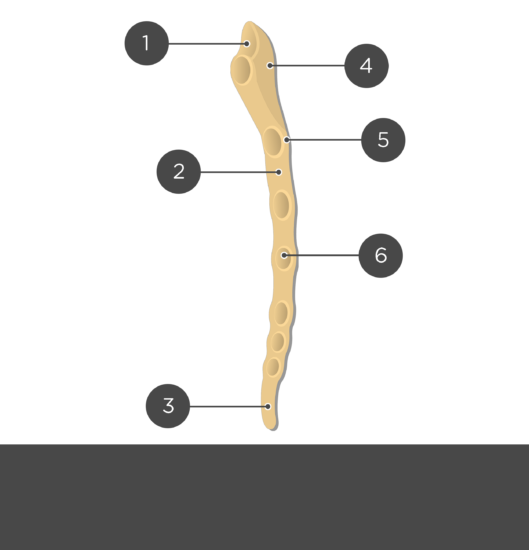 They serve as an articulation points for the clavicle. 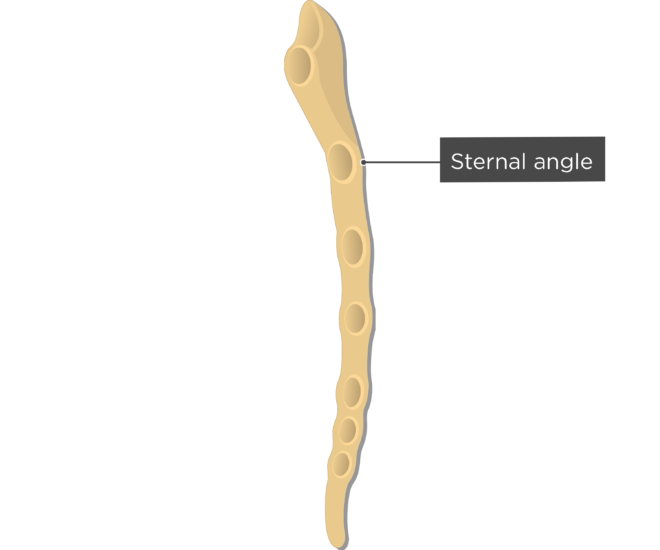 Sternal angle – slight, anterior protrusion formed at the junction of the manubrium and body. 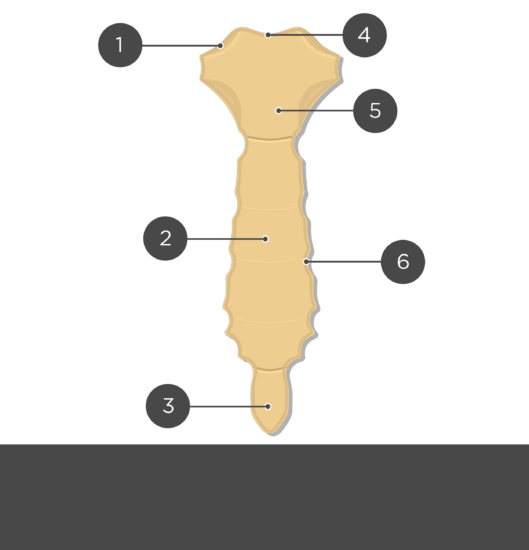 Palpation of this bony landmark indicates the relative position of the second ribs. 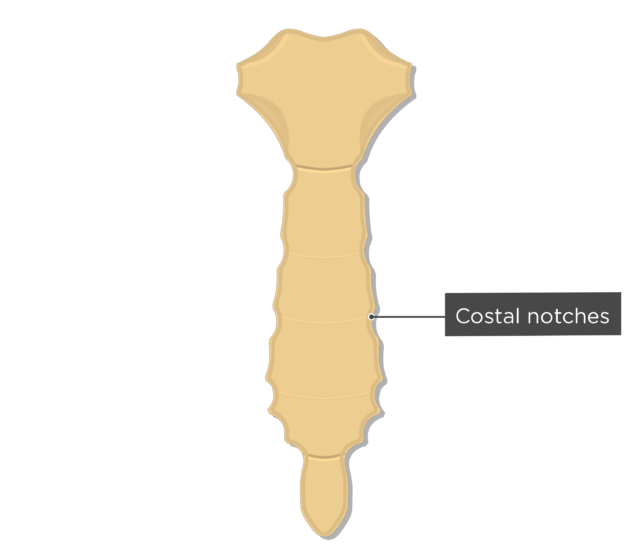 Body or gladiolus (L. gladiolus, little sword) – middle segment of the sternum. 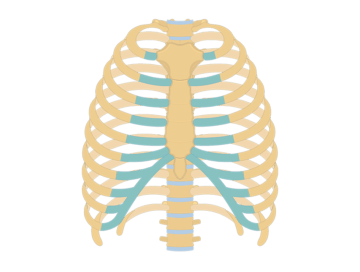 Review the anatomical characteristics of the rib and ribcage in this interactive tutorial and test your knowledge in the quiz.